Total Accuracy Play-Along Tracks Crank up your amp and go for it! Play lead guitar with our pro session band on 10 tracks in a variety of blues styles. 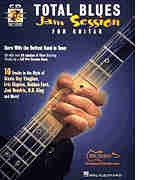 Includes 90 licks, tips on solo construction, phrasing, scales, string bending and vibrato. CD includes over 60 minues with full-band backing tracks.